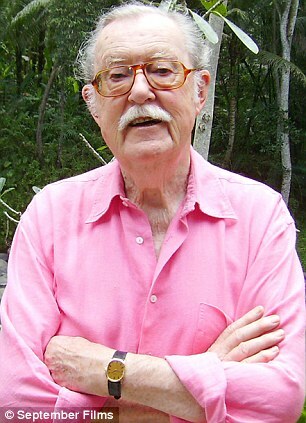 Last week the celebrated broadcaster and globetrotting TV presenter departed Whicker’s World-at-large. Aged 87 and living with Valerie Kleeman, his partner of more than 40 years, I was reminded of the night I spent at his home in Jersey some 13 years ago. take this every day. Helps with keeping things moving and feeling good. Online pharmacy cialis? Our company is a professionally managed distributor of generic drugs. I was working at AOL all those years ago heading up a PR team responsible for communicating the benefits of the proprietary internet service, with its endless channels of ‘exclusive content’. I had an idea. Maybe we could link the Travel Channel to a semi-retired Alan Whicker, who the media would be keen to interview. He would then be fully briefed to weave in the internet service provider on cue wherever possible. There was one issue. Actually two. Not only had Mr Whicker never used the internet, he didn’t even own a computer. Living a quiet life in Jersey, he hadn’t seen the need to plunge himself into ‘new media’. And so I was sent for, along with my friend* the editor of AOL’s Travel Channel. We were asked to spend 48 hours with the national treasure with trademark moustache teaching him how to get online or at least appear au fait, in front of any questioning journalists. His home was full of memorabilia together with his numerous broadcasting accolades. It felt like a tribute to his career with every inch of every wall covered with photographs, newspaper articles and artifacts from the many countries he had visited. After an early start to travel from London to Jersey and then a long day of mouse clicking, my colleague and I were ready for an early-to-bed as we were shown to our respective ensuite bedrooms. Unfortunately, this was not how Mr Whicker had seen the evening would play out. We were asked to ‘dress for dinner’ before meeting for a pre-dinner cocktail in the drawing room. I panicked, as had only packed jeans for my night away. But my colleague panicked more when she found herself locked in her musty bedroom with only magazines from the 1980s picturing Whicker on the cover to keep her company. 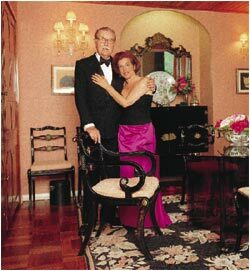 Finally, as we descended the staircase, we found Alan and Valerie dressed as if for a Hello magazine photo-shoot in their drawing room. Dinner was a lively affair as Mr Whicker told many tales of his adventures. Aged 74, it can’t have been an easy transition for this old-timer to make the shift from old to new media and it could have extremely uncomfortably staying in his quirky home – but instead we left having taught the horn-rimmed glassed broadcaster a thing or 2 about the world wide web as we giggled all the way back to the airport. *The then editor of AOL’s Travel Channel is now a pretty well-know illustrator and cartoonist. Check out her work here.